This, is a blunt steel training sword we use for strength training and conditioning ourselves. Every time you do something wrong with this thing, it rewards you with new and exciting aches and pains. If your swing was wrong, it rewards you with a splitting pain to your shoulder and a noticeably sloppy swing. If your grip is bad, it rewards you with burning pain in your hands and splitting skin. Even your stances start to falter from the added weight if you aren’t maintaining them correctly. 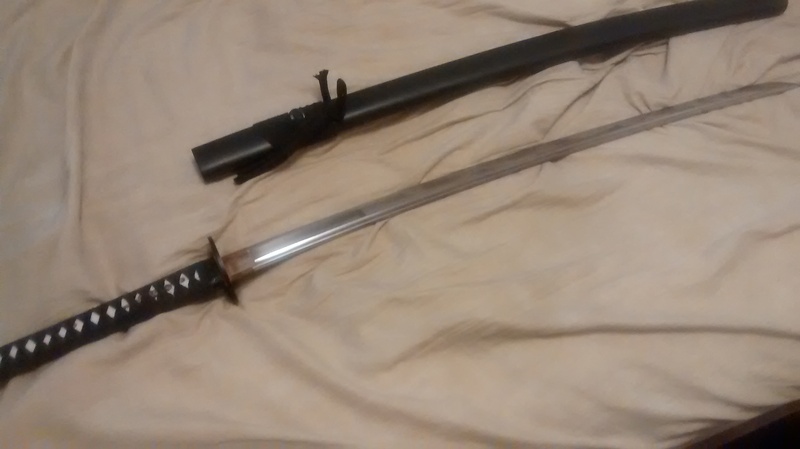 Everything about using this sword is about fixing every little detail in your techniques, and once you are permitted to use these I would encourage all students to use them as frequently as possible. Cause let me tell you this, you are going to want to get all these pains and mistakes out of the way now while you are using a blunt one, then when you are using the real deal. I have found that I am able to go the entire class with one of these, but doing so wears me down and causes my form to be sloppy after an extended period, therefore I mostly use this out of the actual class to try and build myself up to it, hoping to soon achieve the skill to use it without letting the difference in weight affect my technique. There is always more training that you can do, and there will always be ways to push yourself harder. And that will never change. Just be sure that you don’t injure yourself in the process. Everyone has limits and knowing those limits and pushing them just enough is the key to surpassing them, but pushing them too far can result in your limits being permanently harder if you injure yourself in the process.